Dealing with insurance companies after a car accident can be frustrating and difficult. If you believe that an insurance company may be negotiating your car accident claim in bad faith, you may be entitled to take legal action against the insurance company. This article provides some basic information about bad faith insurance tactics in car accident claims. It is not a substitute for speaking to an attorney. Only a qualified car accident lawyer can give you legal advice. All insurance companies are required to investigate, negotiate, and settle claims in good faith. This is due to a longstanding duty which automatically exists in every insurance contract known as the “implied covenant of good faith and fair dealing.” It requires the party or parties to a contract to treat each other honestly, fairly, and in good faith, so as to not prevent the other party or parties from receiving the benefits of the contract. When insurance companies violate this duty, they can be held liable in court for their bad faith acts. 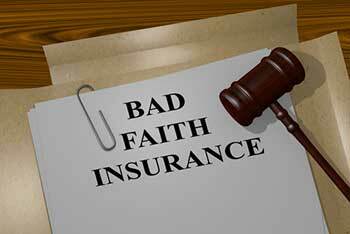 All jurisdictions, including Texas, recognize the right of those harmed by bad faith insurance tactics to bring a claim against the insurance company for its bad faith tactics. These types of claims, which arise under tort law, are often referred to as bad faith insurance claims or bad faith insurance lawsuits. When an insurance company denies a claim following a car accident, it should give a reason. If you made a valid claim to an insurance company after a car accident and it was denied for no reason or for an invalid reason, you may have a claim against the insurance company for bad faith. The duty of good faith and fair dealing requires insurance companies to conduct prompt and thorough investigations into car accident claims. If an insurance company has delayed its investigation into your claim or conducted a poor investigation, you may have a bad faith insurance claim. Insurance companies must pay on claims within a reasonable time frame. If an insurance company has approved your car accident claim, but has unreasonably delayed payment of the claim, you may have a claim against the insurance company for bad faith. If an insurance company is refusing to settle or pay a valid claim after a car accident, it is likely acting in bad faith. If you filed a claim with an insurance company after a car accident that was clearly covered by your policy or that of the other driver and it was denied, the insurance company may be liable for its bad faith denial. Insurance companies should never threaten policyholders or third parties who make claims after a car accident. Insurance companies should treat policyholders and others in a respectful and professional manner. If an insurance company has made threats of any kind against you, contact an experienced car accident lawyer right away. If an insurance company has intentionally misrepresented the law or language in the insurance policy applicable to your car accident claim, you may have a legal claim against the insurance company for bad faith. As part of the duty of good faith and fair dealing, insurance companies must be honest and truthful in their statements about the law and the insurance policies involved in a claim. Insurance companies should always comply with reasonable requests for documentation from policyholders and third parties. If you have asked an insurance company to provide documentation in support of its decisions and the insurance company refused to supply it, you may have a claim for bad faith. In order to establish that an insurance company acted in bad faith, you must show that the facts and circumstances surrounding the insurance company’s actions indicate that the company acted in bad faith. Because the bad faith inquiry is focused on specific facts and circumstances and varies in each case, it can be very difficult to establish that an insurance company acted in bad faith. This is one of the many reasons why you should work with an experienced car accident lawyer after a car accident. It is important to understand that your claim against an insurance company that you believe acted in bad faith is separate from that against the other driver who was responsible for your accident. A bad faith insurance lawyer can help you better understand how a bad faith insurance lawsuit differs from a car accident lawsuit filed against the at-fault driver. If you were involved in a car accident and believe that an insurance company is acting in bad faith with respect to your claims, a car accident lawyer may be able to help. Sutliff & Stout are Houston, Texas car accident lawyers who have experience handling bad faith insurance claims. To schedule a free and confidential consultation about your case, text or call (281) 853-8446 anytime, 24/7.